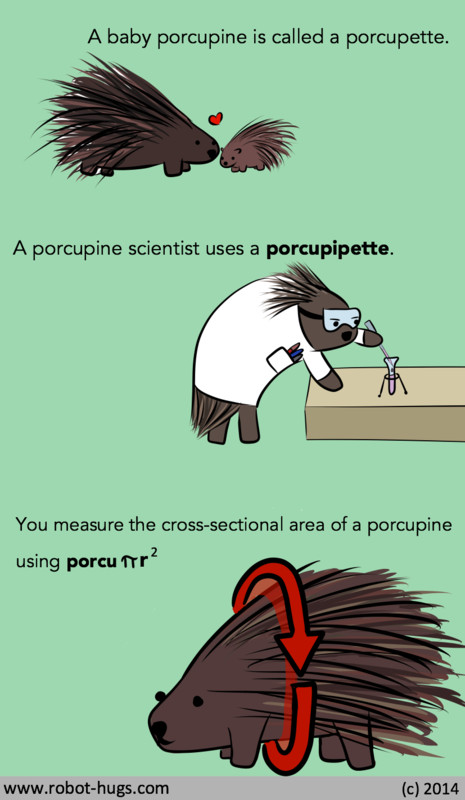 A porcupine scientist uses a porcupipette. EDIT: well, that’s what I get for not fact-checking. Image updated to reflect that the equation reflects area, not circumference. Points to my sharp-eyed and more mathematically competent readers for tactfully pointing this out. Robots, all of the above facts about porcupines are true – I have researched them exhaustively. Porcupines are one of the most awesome of creatures. They’re shaped like basketballs, have a soft, warm underbelly and a defensive, prickly overbelly. They like pats. They make awesome weird noises. Look, I’m not saying that if you live in a place that doesn’t have porcupines, you should find some and introduce them to your ecosystem as an invasive species, but you should definitely do that because they are awesome and there is no foreseeable downside for anyone.